This is a Mercury Redstone rocket. It is a modified version of the Army's Redstone missile (also referred to as a "Tactical Redstone"). This particular rocket stands outside of Gate 3 at the Kennedy Space Center. The Redstone missile is considered to be the successor of the German V-2. Research conducted on the V-2 at the Army's White Sands Missile Range in New Mexico gave way to a number of improvements. These improvements were incorporated into the Redstone missile, which was designed by the ABMA (Army Ballistic Missile Agency). The first Redstones (for research and development purposes) were built at the Army's Redstone Arsenal in Huntsville, Alabama. The first of these was flight tested on August 20th, 1953. Though the first Redstone missiles were built by the Redstone Arsenal, the Chrysler Corporation received the contract to build the production models. The first of these was launched on July 19th, 1958. Further modifications to the Redstone missile yielded the Jupiter-C (Juno I) rocket, which launched Explorer I, America's first satellite. Starting in 1959, some Redstone missiles were modified for NASA's Mercury program. The propellant tanks were elongated by 96 inches, adding 20 seconds of burn time. The warhead section of the missile was replaced with the Mercury capsule and escape tower. The first of these Mercury Redstone rockets was successfully launched from Complex 5 at Cape Canaveral on December 19, 1960 in mission MR-1A. Length 83 ft. Diameter 70 in. 1 Redstone 1 Rocketdyne A-7 LOX, Ethyl alcohol, water 78,000 lbs. At left is a detailed photo of the Mercury Redstone's Rocketdyne A-7 engine. This is an improved version of the Redsone missile's 75,000 lb. 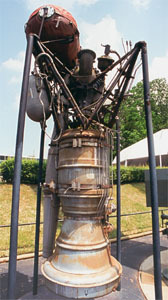 thrust A-6 engine. Additional improvements to the A-7 (including the use of Hydyne fuel in place of alcohol) further increased the thrust to 83,000 lbs.